Features: 3 Door, Hatchback, Radio, CD Player, Driver's Air Bag, Power Steering, Air Conditioning, 4 Cylinders, Manual Transmission, etc. 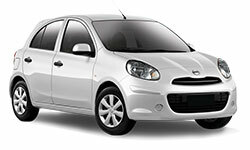 One of our most popular cars due to the price to rent and the price on fuel. If you have much luggage or more than 2 people a larger car is normally recommended. Power is rated to be economic which means it's fairly low powered compared to the other rental cars on offer. Does it really matter though when it's still enough to maintain the speed limit on all Australian high ways anyway.